Operation Write Home has lost a creative lady who brought joy and comfort to the friends and family of our deployed military through her creativity and devotion to making cards. Here is my CASE of one of her cards. 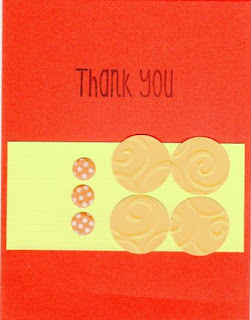 You can see them all at the OWH Blog, Stars and Stamps. The scan of this card did not work well with showing off the sherbet-like colors. The wide strip is green and the larger circles a bright yellow. It looks so pretty in person. Sorry it looks so faded here. Very nice tribute to Jane. I hate it when you can't seem to get a good likeness of the cards. This card looks good me be as is, so I guess if you say the picture does not do the colors justice, it must really be pretty in real life. Thanks for sharing. Nice card and I'm sure Jane would love it! The colors are bright and cheery. Very clever changing Jane's case card up by using circles instead of squares. The embossing on the circles is a nice touch.